If you want to increase your profit potential, strategic home improvement ideas in these six categories — some of whichwon’t cost you a thing — will give you the biggest return on your investment. Instead, bring the space to the point of what’s known as “builder-grade luxury”: Replace basic black appliances with stainless steel, for example, and ditch the laminate countertops in favor of granite. Yes, these home improvement ideas might sound pricey, and you couldspend a pretty penny on appliances and granite, but builder-grade improvements stop far short of those over-the-top luxuries. 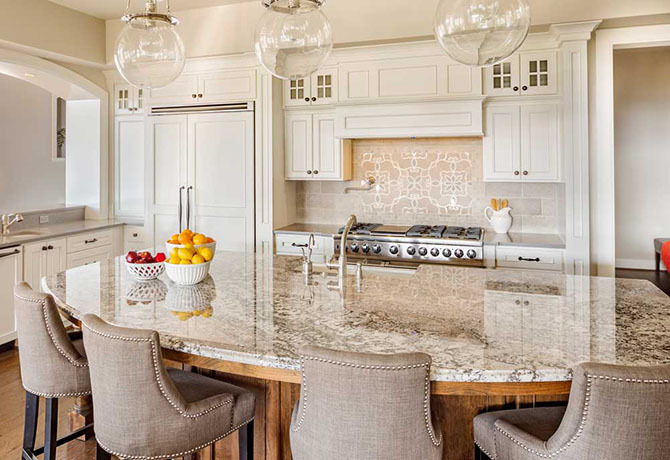 So make your decisions with thriftiness in mind: choose one of the more affordable granite countertops (such as Napoli, Baltic Brown, or St. Cecilia), with a crisp and in-style beveled edge. Leave higher-end stone and more ornate beveling for your next home. The cost to upgradeappliances and/or countertops will vary within the four-digit range. But to keep this upgrade within your budget, try to find a deeply discounted appliance at an outlet or local “scratch-and-dent” store — where almost-perfect pieces come with perfectly approachable price tags. As with a kitchen remodel, consider which changes will have maximum impact. You may not need to replace that old pedestal sink. Instead, you could change out the faucet — upgrade it from nicked brass to sleek new chrome — and hang some luxurious towels next to it. The same goes for quirky floor tile; choose a new paint color that will enhance it rather than clash with it. Make sure the colors and styles you choose are as universally appealing as possible so buyers see a space they know they can live with. And again, scrub your bathroomfrom top to bottom — there is no bigger turnoff than yellowed grout and leftover toothpaste in the sink. Paint still reigns supreme as the easiest and cheapest way to refresh any room, especially if you do the work yourself. Whites and neutralscan help buyers envision themselves in the space, since they provide a blank slate to serve as a backdrop for buyers’ stuff. Forgo that bold navy accent wall — the idea of priming and painting over it will just stress buyers out. Plus, lighter earth tones look good with hardwood floors, and white always brightens a room. If your rooms include mixed wood surfaces (floors, doors, and cabinets), select a neutral color and ask your local paint purveyor to mix in a few drops of gold to add warmth and harmonize discordant wood tones.